An extra large episode 7 is here! I am joined this time by future podcaster and staple on the Dirty Bay Horror Podcast, Dave Z. 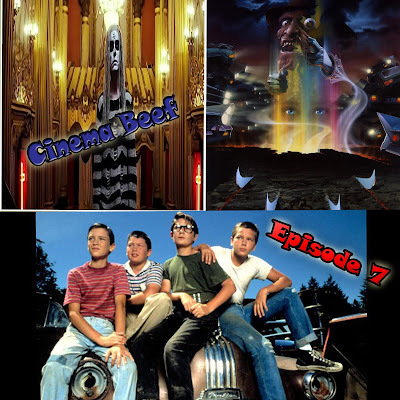 Just like almost every one of my shows, we discuss three films. We start with a film that I said I would never discuss again but the guest decided to torture me. We talked about you guessed it, Rob Zombie's horror swan song Lords of Salem! Next, we go into dreamland and check out those crazy kids on Elm St. when we discuss the fourth installment, The Dream Master. Finally, we say hello to Mr. King and check out our own childhood demons when we discuss Rob Reiner's classic Stand By Me. So, don't play records from strangers, drink lots and lots of Red Bull, and never bury your life savings under the porch. Join the Cinema Beef Facebook Group! If you have feedback or you want to be on the show, e-mail me here! Get the Dirty Bay Horror Podcast here! Join the Dirty Bay Horror Facebook group! "Spiders" performed by System of a Down from the album "System of a Down"
"Black Magic Woman" performed by Santana from the album "Abraxas"
"Are You Ready for Freddy?" Performed by The Fat Boys from the album "Nightmare on Elm St. 4 OST"
You can also get us on iTunes, Talkshoe, and Stitcher smart radio!